These days, digital cameras are a dime a dozen. Okay, they aren’t that cheap just yet, but they are a lot less expensive than they were a few years ago. Pentax announced the release of the Optio E60 digital camera, which could be the cheapest digital camera for a 10.1 Megapixel model with 3x optical zoom lens. Of course, just because it is cheap, doesn’t mean that it is “cheap”. In other words, the Optio E60 has a lot of cool features for something of its price. 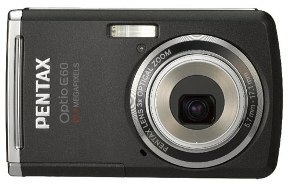 The Optio E60 has a 2.4 inch LCD, and 6.3 MB of internal memory (with the option of SD/SDHC memory cards). It also has a shutter speeds of 1/2000 to 1/4 of a second. As for sensitivity, it is at 100 to 6400, which can be fixed at specific or auto mode settings. There is also a digital shake reduction option in photo and video modes, as well as Face Detection. You should be able to purchase the Pentax Optio E60 for about $140 after its initial release in October. I have no doubt that it is targeted toward the typical consumer, and that it will be easy and should take quality pictures.